Saturday, March 7 1908 -- In the first exhibition game between the Chicago White Sox and the Angels, hometown fans get the thrill of seeing their local boys make good, posting a 'W'. The White Sox players have been on a train for days, and haven't practiced since the end of the previous season, but still .... !! Jack Wilson alit at NEA for a short stint in 1915-16,and created a few features, including Andy the Ad Man, for them. Now if you read these samples you'll wonder why I call the strip by that name. There is no indication that Andy is in the advertising business, and besides, the strip is clearly titled Andy the Wise Guy. Well, all I can tell you is that the strip bore that name in the NEA archives and in quite a few papers. Maybe Andy's advertising angle only lasted the first few strips, and the Atlanta Journal, the paper from which these samples originated, had the sense to come up with a different name. I dunno. But that's my story and I'm sticking to it. 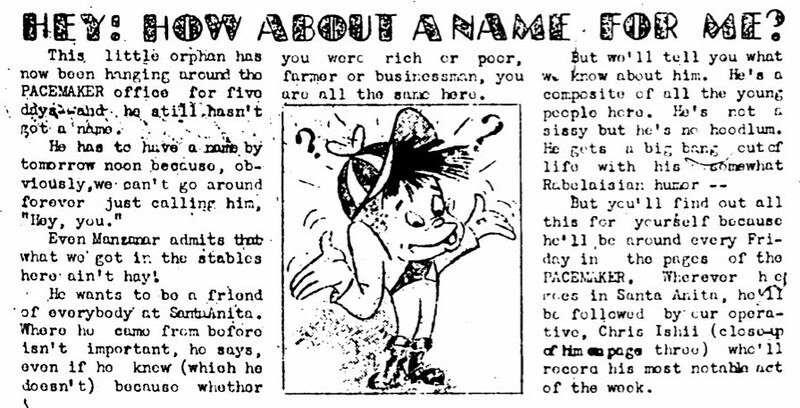 Andy the Ad Man ran from October 22 to December 10 1915. After that the strip was revamped, dropping the Andy character and making Harrigan the star. And that strip will be covered some other time. Kishio Christopher Ishii was born in Caruthers, Fresno County, California on August 11, 1919, according to the Archives of American Art (birthplace) and the California Birth Index, 1905-1995 at Ancestry.com. He was in Japan when the 1920 U.S. Federal Census was enumerated. On June 12, 1920, his family sailed from Kobe, Japan and arrived in Seattle, Washington on July 1. He was the youngest of four children born to Koshiro and Naka. His father was a farmer. They had visited his father's mother in Toyotamura Kagawa-ken. 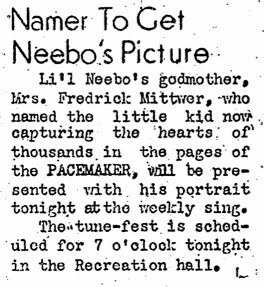 The 1930 census recorded him in the 17th Judicial Township, Fresno County on Fig Avenue. He was the fourth of six children, and his father continued as a farmer. Ishii graduated from Caruthers Union High School. Archives of American Art said he attended "Chouinard School of Art…in Los Angeles and upon graduation worked for Walt Disney Studios until World War II." In late May 1941, a strike was called against Disney. Drawing the Line: The Untold Story of the Animation Unions from Bosko to Bart Simpson (2006), said, "A local newspaper article of the time noted that all four of the Nisei artists went out on strike: Chris Ishii, Tom Okamoto, Masao Kawaguchi, and James Tanaka." They found work elsewhere when the strike ended. On December 7, 1941, Japan declared war on the United States by bombing Pearl Harbor. 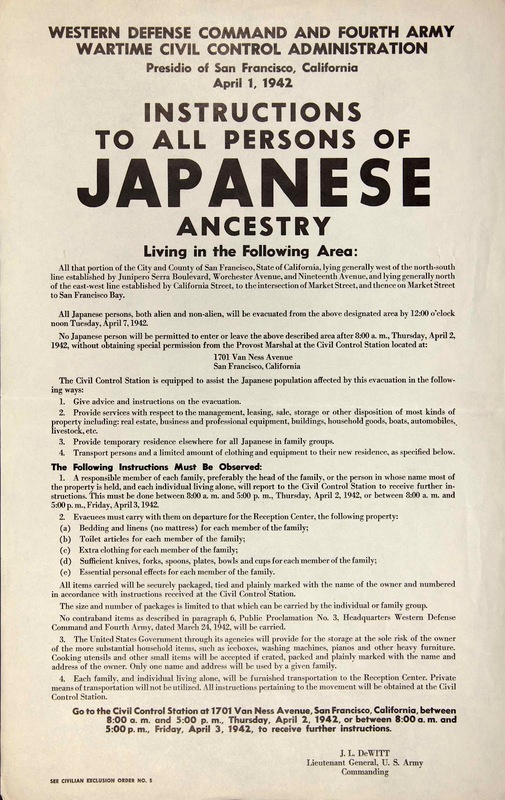 Life soon changed for thousands of Japanese Americans on the West Coast. In April 1942, Ishii was relocated to an assembly center, a racetrack in Santa Anita, California. 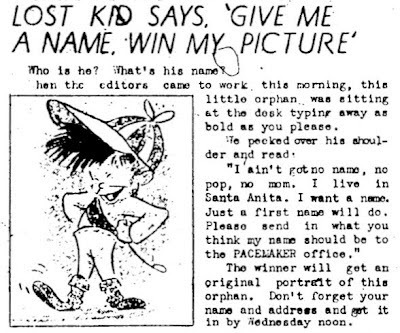 A newsletter, Santa Anita Pacemaker, was produced and soon featured his cartoon character, Li'l Neebo. First, there was a contest to name the character. At the start of World War II he was interned at the Assembly Center at Santa Anita and then transferred to the Granada Relocation Center in Amache, Colorado. In both places, he worked on the camp newspapers as a cartoonist. 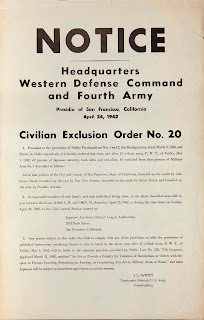 Volunteering to join the U.S. Army from Amache in 1943, he served in the Military Intelligence Service as an illustrator for the Office of War Information, assigned to the India/China/Burma theater of war. 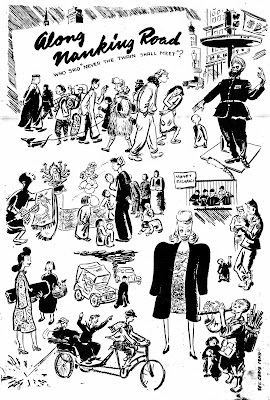 He met and married his wife, Ada Suffiad in Shanghai, bringing her to the U.S. with him at demobilization. After the war he briefly studied art in Paris, France. Archives of American Art said: "…In 1951 he traveled to Paris on the GI Bill to study at the Académie Julian with Fernand Léger." The IMDb bio said, "…In 1952, he settled with his family in New York…He worked at UPA Studios on 'A Unicorn in the Garden' and 'Madeline,' and on Gerald McBoing Boing and Mr. Magoo cartoons. Joining with two partners in 1965, he formed Focus Productions…He became a freelance artist in 1975, and contributed the animated sequence in Woody Allen's 'Annie Hall'…"
His wife passed away February 17, 1988. Ishii passed away November 6, 2001, in Dobbs Ferry, New York. A filmography is here. Alex Jay, thanks for putting this profile together! There is another one on Cartoon Brew on his animation work, and that of other Niseis who worked for Disney before WW II, but it's great to see the Lil Neebo stuff, and the pieces from Stars and Stripes. Chris Ishii was my father. Sadayuki Thomas Okamoto was born in Kent, Washington on March 15, 1916. His Japanese name is from the record, Japanese Americans Relocated During World War II. The birthplace was on a 1918 passport application, although the birth year was recorded as 1915. His birthdate is from Washington Births, 1907-1919. According to the application, he lived in Hiroshima-ken, Japan since September 28, 1916. He, his mother, older brother and sister arrived in Seattle, Washington on March 16, 1918, as recorded on a passenger ship list. All records are from Ancestry.com. Okamoto has not been found in the 1920 U.S. Federal Census. His name was recorded on a passenger ship list. From Yokohama, Japan, he arrived in Seattle on November 14, 1927. He has not been found in the 1930 census, and the date of his move to Los Angeles, California is not known. Editor & Publisher, December 24, 1955, said, "...After one year at Sacramento Junior College, he attended Chouinard Art Institute in Los Angeles, following with a job as staff artist in the Walt Disney studio." Asian American Art, 1850-1970 (2008) said: "The growing industry of Hollywood provided employment to many Japanese American artists—behind the camera or at the animation table….Chris Ishii, Tom Okamoto, Tyrus Wong, Milton Quon, Wah Ming Chang, James Tanaka, Robert Kuwahara, and Gyo Fujikawa all worked for Disney at some point in the pre-World War II period…"
In late May 1941, a strike was called against Disney. Drawing the Line: The Untold Story of the Animation Unions from Bosko to Bart Simpson (2006), said, "A local newspaper article of the time noted that all four of the Nisei artists went out on strike: Chris Ishii, Tom Okamoto, Masao Kawaguchi, and James Tanaka." Apparently, the quartet found work elsewhere when the Disney strike ended. Tom Okamoto, one of the outstanding artists in the Center, who teaches art classes daily from 1 to 5 p.m. in the Grandstand, said, "There are two kinds of art. One is to please other people. The other is to express the way you really feel. I think the latter is much deeper and satisfying." As an example of this, after Okamoto was evacuated to Santa Anita from the westside in Los Angeles, he painted a picture called "Last Look." In the background of the picture stands the tower of the Japanese M.E. church at 35th and Normandie. The picture has an air of desolateness and loneliness about it. "I wanted to show the loneliness of the scene. Just before we piled into the buses, I walked around and took one good 'last look,' at this place. In spite of all the traffic and people milling about there was a desolation of spirit. I wanted to express it on canvas." Okamoto believes that in teaching the students the fundamentals of art, the students should be encouraged to choose objects that are the most familiar to them or closest to them—something they know and understand. "A teacher," said Okamoto, "should find out the background of his students in order to bring out their hidden talents and capabilities." 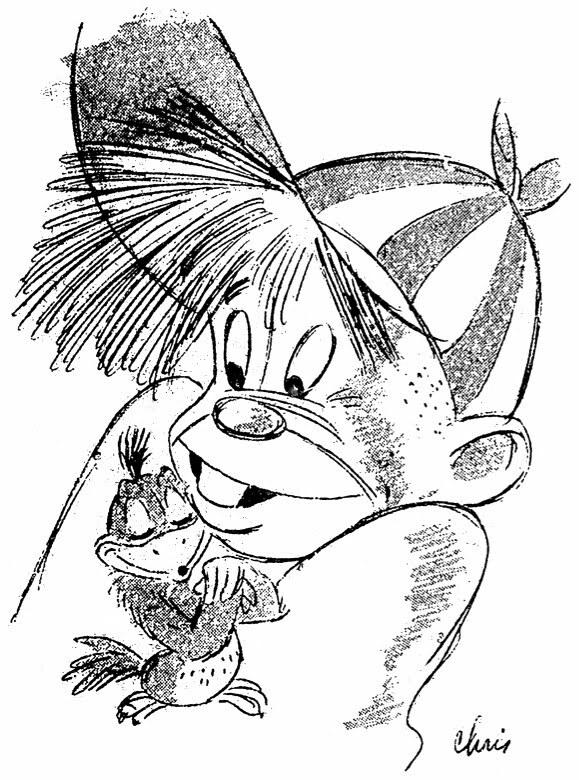 The Pacemaker also published Ishii's panel cartoon, Li'l Neebo. 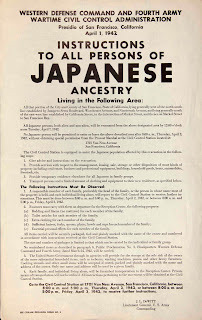 Soon, Ishii and Okamoto were transferred to the Granada Internment Camp in Amache, Colorado. Sonoma State University's North Bay Digital Collections has a photo of Ishii and the description says: "…Chris created a cartoon character names "Lil Nerbo" [sic] or little Nisei boy. The cartoon strip he created quickly became a favorite with evacuees. When Chris left Amache, the comic strip was continued by Tom Okamoto, another Disney animator, and later by Jack Ito." 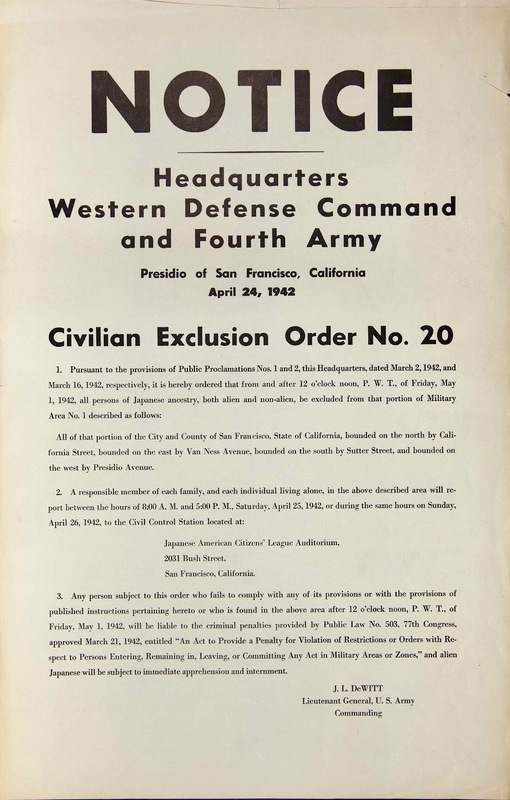 According to Editor & Publisher, "…In 1943, he [Okamoto] served in the Army as a master sergeant in military intelligence…" He was stationed at the Military Intelligence Service Language School, located at Fort Snelling in St. Paul, Minnesota. While he was there, Okamoto designed an emblem for the school. Editor & Publisher also said: "…when he was discharged in 1947, he went to Art Center School in Los Angeles until 1951." 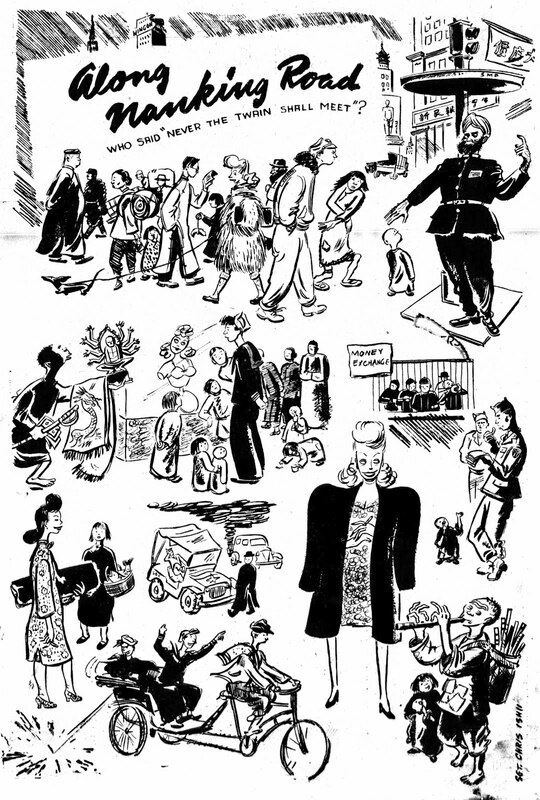 This snippet was found in Scene, The International East-West Magazine, Volume 3, 1951: "Tom Okamoto, California cartoonist, gets fresh ideas for his syndicated cartoon strip by watching his two sons, Deems and Eric, in the living room of the Okamotos' new home in El Monte, Calif. Mrs. Okamoto looks on." Named after his oldest son, Deems began sometime in 1951. In late 1955, his strip, Little Brave, was named the top winner in United Feature Syndicate's $10,000 Talent Comics Contest. The Sunday Herald (Connecticut), February 12, 1956, announced the winners, too. He used the pseudonym Tom Mako on his strip. Okamoto passed away November 20, 1978, in Contra Costa, California, according to the California Death Index at Ancestry.com. Robert "Bob" Kuwahara was born in Tokyo, Japan on August 12, 1901, according to Kuwahara's biographical sketch at the In Memoriam page of the National Cartoonists Society (NCS) website. Wikipedia said his Japanese name was Rokuro. The NCS bio said he, "…came to good ol' U.S.A. in 1910…held a book upside down the first day in school but managed to get away with a sheepskin from the Los Angeles Polytechnic High School in 1921…" Asian American Art, 1850-1970 (2008) said he lived in Santa Barbara, California from 1910 to 1914, then in Los Angeles. 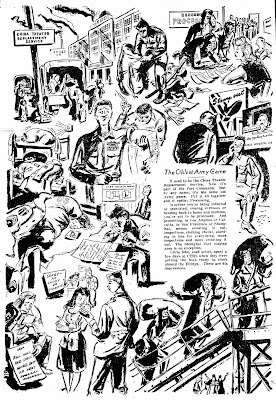 The newsletter, Santa Anita Pacemaker (California), July 1, 1942, published "Former Studio Artist Now Supervises Art Classes" which said, "…Kuwahara got his start as a cartoonist for the Poly Optimist, a Los Angeles high school newspaper. He attended the Otis Art institute then went to New York where he did portrait work for well-known book publishers." The 1920 U.S. Federal Census recorded Rokuro Kuwahara in Los Angeles at 138 Carr Street. He was the youngest of six children born to Yusho and Yoshio. His father operated a laundry. 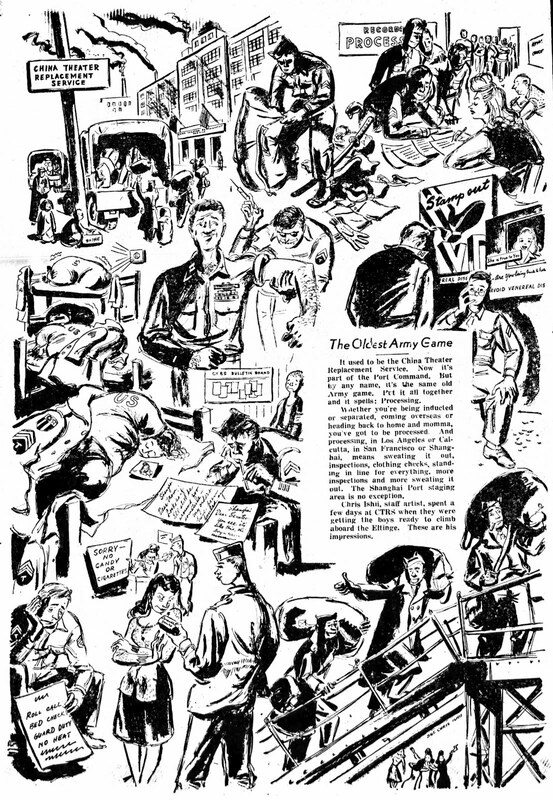 According to the NCS bio, "…followed 7 years of drawing and painting at the Otis Art Institute in Los Angeles…off to New York in May, 1929 for a fling at commercial art…Crash!…You know what happened in 1929…"
…worked as an editor of the English section of the Rafu Nichi-Bei newspaper. After resigning from the Rafu Nichi-Bei in 1929, Kuwahara held a successful solo-exhibition of pastel portraits and pen sketches at the Olympic Hotel in Los Angeles and sold thirty-two pieces. The Rafu Shimpo newspaper reproduced two of Kuwahara's sketches…with a review of the show….Shortly after this success, Kuwahara moved to New York City to work as a freelance portraitist and artist for various book publishers. In the 1930 census he lived in the Bronx, New York at 950 Woodycrest Avenue, apartment B25. He was a commercial artist. His roommate, Thomas Hayakawa, was a translator. 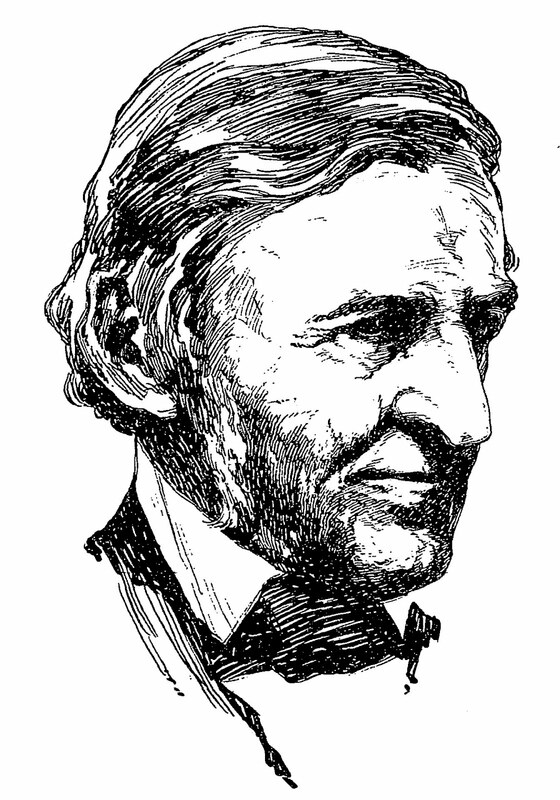 His drawing of Ralph Waldo Emerson was recorded in the Catalogue of Copyright Entries, Part 4, Works of Art, Etc. 1930 New Series, Volume 25, Number 3. The New York Times, April 3, 1932, published a portrait of Emerson by Kuwahara. The portrait was copyrighted by William Edwin Rudge, a book publisher, who produced an Emerson book, Uncollected Lectures, in 1932. Evidently, Kuwahara's drawing was based on a photograph. According to Asian American Art he returned to California in 1931. In Los Angeles, he found work in animation and married Julia Suski, a musician and graphic designer for the Rafu Shimpo. At NCS, Kuwahara wrote that he "went crawling back home and to work for Walt Disney in 1932. Then off to M.G.M. in 1937…" Some of his Disney credits are at The Encyclopedia of Disney Animated Shorts. Asian American Art said, "…Chris Ishii, Tom Okamoto, Tyrus Wong, Milton Quon, Wah Ming Chang, James Tanaka, Robert Kuwahara, and Gyo Fujikawa all worked for Disney at some point in the pre-World War II period…"
During internment, Kuwahara and his family were held first at the Santa Anita Assembly Center and then at Heart Mountain Relocation Center in Wyoming. Kuwahara's accomplishments were well known to camp supervisors. While at Santa Anita, Kuwahara was allowed to teach art classes twice a week. The Santa Anita Assembly Center was in use for six months, April to September 1942. 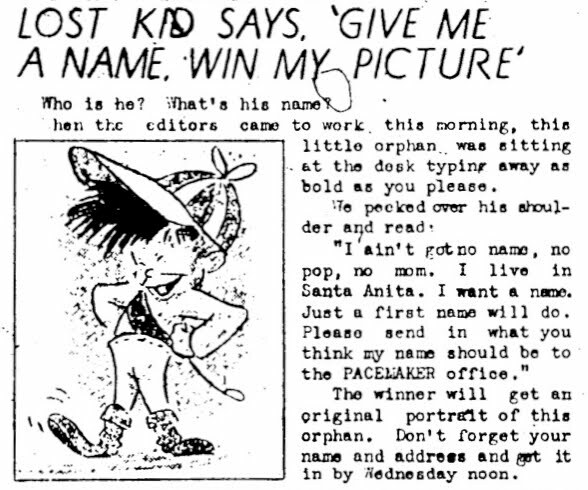 The center's newsletter, Santa Anita Pacemaker, was published during that time. Kuwahara was mentioned in the following issues: June 3, 1942, page 3, "Candidates for Election"; June 6, 1942, page 1, "Art Classes"; July 1, 1942, page 2, "Royal Spartans See Magic", and page 3, "Former Studio Artist Now Supervises Art Classes" (available at Genealogy.com); July 4, 1942, page 4, "Creativeness Shown in Handicraft Exhibit." During the relocation to Heart Mountain, Asian American Art said he collaborated with a group of "Nisei artists that included Hideo Date, Riyo Sato, and Benji Okubo….they practiced their craft, taught art classes to the residents, and displayed their works in shows….In 1943, Kuwahara exhibited a collection of watercolors at the Chicago branch of the American Friends Service Committee." With his release in 1943, he moved to Chicago to work as a commercial artist. The Catalog of Copyright Entries, Part 1, Group 2, Pamphlets, Etc. 1944 New Series, Volume 41, Number 12 had the following entry. On December 24, 1955, Editor & Publisher announced the five winners in "United Feature Syndicate's $10,000 Talent Comics Contest." Kuwahara's Marvelous Mike was one of them. Also a winner was Little Brave by Thomas Okamoto, who was interned at the Santa Anita Assembly Center. 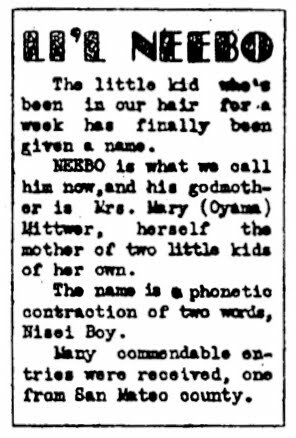 When the Sunday Herald (Connecticut), February 12, 1956, reported the winners of the contest, Okamoto used the pseudonym, Tom Mako. Marvelous Mike strips can be viewed here (first two weeks) and here (final week). Mark Kausler's CatBlog has the entire run of Marvelous Mike. It begins here and continues for 75 posts. Asian American Art said, "He created the Hashimoto Mouse character that appeared in the theatrical release of Hashimoto-san (1959) and directed episodes of the animated television cartoon series Hashimoto Mouse (1959–1963). He also directed episodes of Deputy Dawg." Hashimoto-san is discussed at the Nishikata Film Review. His filmography is at the Internet Movie Database. Lastly at NCS, Kuwahara said about himself, "…Hobby: Golf, what else?…Sport: Golf, What else? Most frustrating game I know…but, dammit, I love it!!" He passed away December 10, 1964, in Larchmont, according to Asian American Art. The Social Security Death Index said his wife passed away September 20, 1996. The couple were among the over one million names placed on the STARDUST spacecraft, launched in 1999. 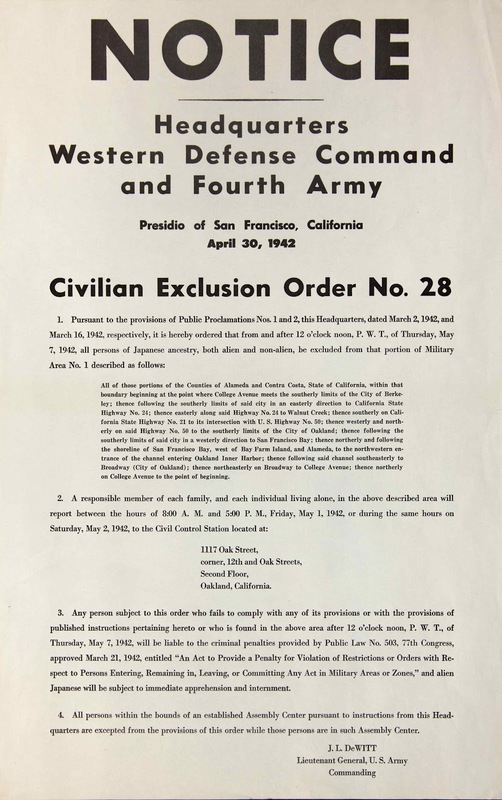 The situation for Bob Kuwahara was different than for most Japanese-American internees. 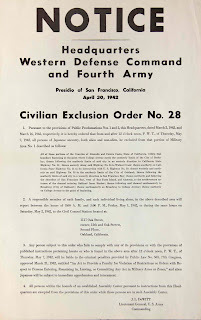 Because he was born in Tokyo he not only wasn't a US citizen, he couldn't become a US citizen under the Naturalization Act of 1790 which restricted naturalization to "free White persons of good character." Thus, unlike most of the people interred on the west coast, he technically really was an enemy alien since he born in Japan of Japanese parents. That particular provision of the Naturalization Act lasted until 1952. It is the nature of the newspaper comics business that if a new feature catches on big, me-too features will follow. And there's at least a slightly more practical reason for the practice than might at first meet the eye. It is easy to dismiss imitation features as the product of people trying to make a quick buck off of someone else's good idea, and that's certainly a big part of the strategy. But there's also the factor of newspaper features being sold under exclusive contracts. For example, let's say that Ripley's Believe It or Not is a big hit (that's not much of a stretch). Now let's say the San Francisco Chronicle has bought the exclusive rights to it in their market. The other San Francisco papers, not to mention Oakland and other surrounding cities, are frozen out. So when another syndicate comes along with a similar feature, and practically every other syndicate did jump on the 'odd facts' bandwagon tout de suite, those papers are downright eager to counter the Chronicle's popular new feature with something similar. Nowadays, when only a few markets like New York and Washington have multiple newspapers, the exclusive contract is a very minor factor, and consequently you don't see many outright copycat features anymore. But back in the day, me-too features fulfilled a pretty important role in competitive markets. So I said all that so that I could say this: here's a feature that takes "me-too"ism in a weird direction. Miki is a bald-faced attempt to copy Crockett Johnson's great Barnaby, of that there can be no doubt. The weird part is that Barnaby was never a particularly successful strip -- speaking, of course, financially, not artistically. Why would you market a copy of a strip that runs in, oh, let's be charitable and just say less than a hundred papers. Misguided as it seems, the syndicate, George Matthew Adams Service, wasn't exactly saddled with a long list of big-selling features in the mid-40s, so maybe a strip that had a chance to sell in a few big markets because of the copycat angle seemed worth it. If that was the idea, I guess the few papers they did sell on that basis (for instance, the Brooklyn Eagle in the NYC market) seem to have made it worthwhile to the tune of a five year run. The strip debuted on March 26 1945 and ended on July 1 1950. Me-too features are rarely memorable, for obvious reasons. Hobbled from the start with the mission of duplicating another feature, the cartoonist not feeling any sense of ownership, what can one expect? If not outright disaster, certainly a pedestrian feature. So was Miki one of them? Sadly, very much so. Everything that made Barnaby great was missing from Miki. The great characters, the magic and whimsy, the nostalgia for childhood -- all utterly missing from Miki. 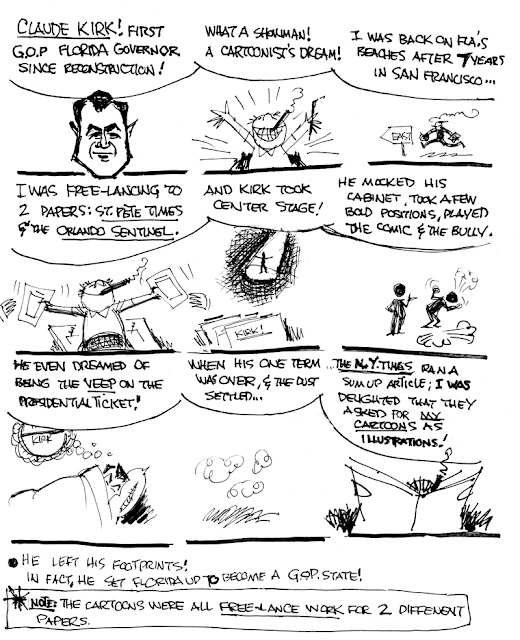 Creator Bob Kuwahara worked on the strip under the pseudonym Bob Kay for political reasons; but also, I'm guessing, he was content to not be identified with it. 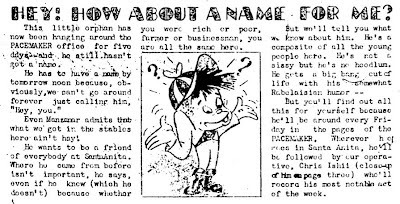 At the end of World War II, the American newspaper reader was not going to take kindly to an Asian name on the comics page, and that probably suited Kuwahara just fine in this case. Miki seems to be embarrassed of itself. The doppelgangers for Barnaby and Mr. O'Malley -- Miki and Uncle Harry -- are entirely devoid of personality, which is no great loss because they appear in the strip as seldom as possible. The setup to the typical story has Miki learning of a problem, telling Uncle Harry about it, and Harry does some magic that will fix the situation eventually. That business is usually transacted in a matter of two to three strips. Then the story, with Miki and Uncle Harry now offstage, goes on for weeks. If Kuwahara was trying to spotlight his other characters, Miki's parents and a buddy, Mr. Morris, in lieu of Miki, that would be understandable. They, at least, weren't created as knock-offs. The problem is, though, that they don't have personalities either. They all seem to sleepwalk through the stories struggling to appear even one-dimensional. They seem like disgruntled actors who are trying to be fired from the production. Maybe this was Kuwahara trying to kill the strip. If it was, he was certainly using slow-acting poison. NB: Sorry about the missing art on the sample strips. 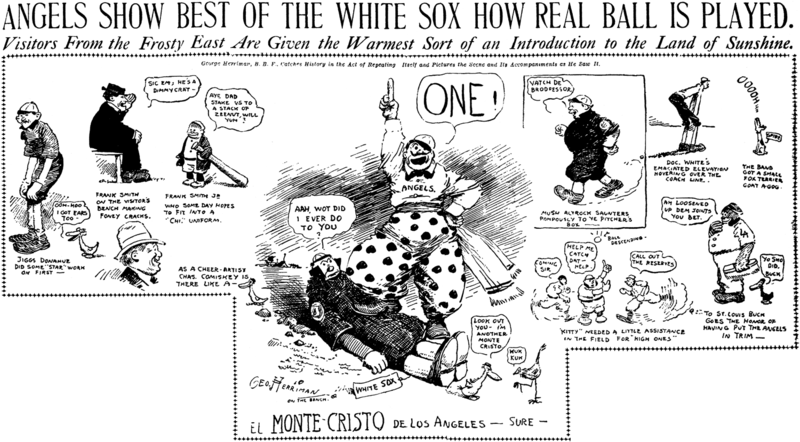 They came from the Youngstown Vindicator, which trimmed the strip bottoms in order to fit more on a page. Unfortunately I have no runs from a paper that printed the strips complete. Great stuff, Mark. I had to google to find your blog, but I like it! I have the color version of the June 5, 1950 Sunday. Contact me at geapelde at euronet.nl for it. Could you also have a look on my blog at The American Way by Tom Kay, which looks remarkably similar in style to this? Join us next Sunday for a sampling of Ivey's Claude Kirk cartoons! !